Have you ever had a feeling that you were being watched or listened to even when you were alone in your own house? Maybe you've been lying awake at night and you could have sworn you heard scratching inside the walls, or a shadow move out of the corner of your eye? We're not trying to alarm you, but your home just might be haunted by a few trapped spirits trying to escape from their eternal tomb. Was it a curse? Did they do something to deserve it? Once out will they be grateful, or seek you out as their first meal in over a hundred years? There's only one way to find out. This 20 square foot wall decoration is actually a massive portal into the other world. The spirits can't quite get through though, so you can observe them from a safe distance. 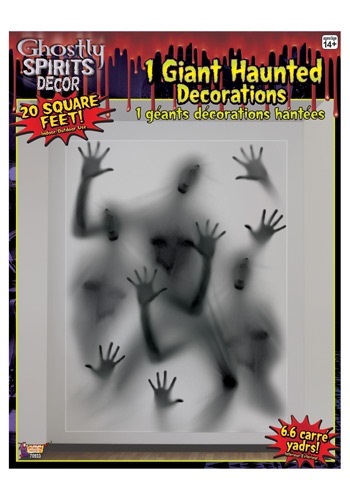 They'll also make a fantastic decoration at your next Halloween party. Here's a spooky tip; if you flash a strobe light in front of it, your guests will swear the still images on the wall are actually moving!